Today we present a delicious pork chop flavored with our Organic Orange Marmalade. Salpiment rib, you cut the clove of garlic in half and untáis the pork chop with him. Then you make incisions on each rib and honey untáis inside. Ribbing is roasted in a pan with a little oil and when it begins to brown, watered with orange juice and a glass of water. While the meat is simmering, peel the carrots, cut into cubes and add to the pan along with the bay leaf, salt and pepper. During the cooking time, the mixture is removed rather frequently to prevent snagging, and in case of drying, more hidrated with juice or water. 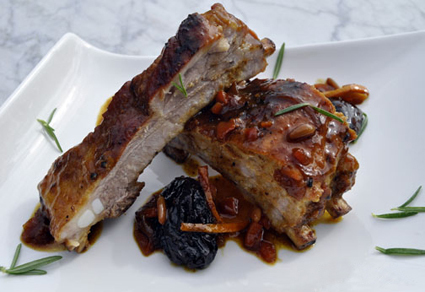 When the meat begins to be tender, incorporad prunes and a cup of white wine, let it cook longer until ribbing is completely tender. To decorate over the plate, and in the absence of the last minutes on adding two tablespoons of orange marmalade that decorate the piece and aromatizarán more sauce. In the presentation you cut the ribs dividing the piece number convenient for diners who believe.